My friend Rita and I sort of went cookbook launch party crazy this last month. We ate scrumptious Swedish meatballs and Swedish princess cake with Marcus Samuelsson…well, we were in the same room…. and listened to him talk about his cookbook, Marcus Off Duty – The Recipes I Cook at Home, to the King of Seattle Restauranteurs, Tom Douglas. The next week, Mario Batali made us appetizers….well, maybe his minions did…and gave us a talk on his new cookbook, America – Farm to Table. The last event was a dinner with Gabrielle Hamilton of the renowned NYC restaurant, Prune, starring her new cookbook, Prune. Unfortunately, I had to give up my seat at this one as Mr. D was in his high school’s male beauty contest, Mr. SHS. But Rita and friend Lori gave me a play by play as they munched on their corned beef tongue – which, according to them, was absolutely divine. 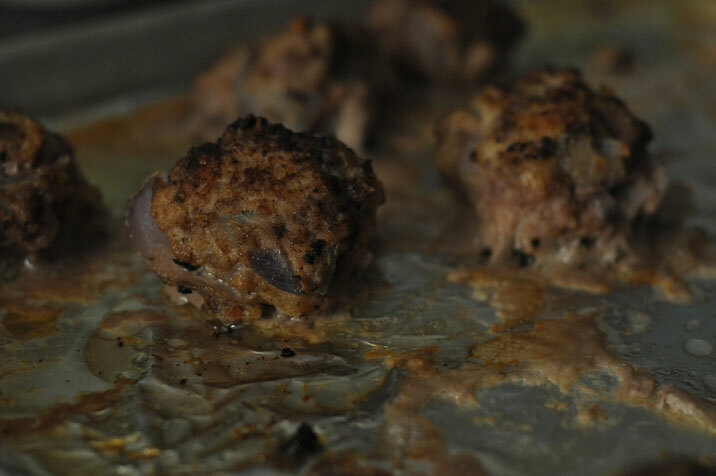 These meatballs are divine. I , of course, doubled the recipe in order to feed us all. The gravy is slightly sweet from the preserves and pickle juice. As I don’t live near an IKEA, lingonberry preserves were not readily available, so I substituted red currant preserves. And, I have to tell you, carrot-apple mashed potatoes are my new favorite fall side dish. Heat the olive oil in a skillet over medium heat and sautee the onion until softened - about 5 minutes. Remove from heat and let cool. Stir together the bread crumbs and heavy cream in a large bowl until the crumbs are thoroughly moistened. Add the sautéed onion, beef, veal, pork, honey, egg and salt (I used 2 t. kosher salt) and pepper to the bread crumbs and mix well. Wet your hands and shape the meat into golf ball sized meatballs. You should have approximately 24 meatballs. I fried mine in batches in a large skillet with a little olive oil until browned all over. I then transferred to a baking sheet and finished baking them in a 350 degree oven for about 20 minutes. For the gravy: In a saucepan bring the broth, cream, preserves, and pickle juice to a simmer over medium high heat. Add the meatballs to the gravy, reduce the heat to medium and simmer until the gravy thickens slightly and the meatballs and heated through - about 5 minutes. Season with salt and pepper to taste. Serve the meatballs and gravy over the carrot-apple mashed potatoes. Toss cucumber slices with the salt and let stand in and colander in the sink for about 30 minutes. Combine the water, vinegar, sugar, bay leaf and allspice in a medium saucepan and bring to a boil. Remove from heat and let cool. Rinse the salt off the cucumber and then squeeze out as much liquid as possible. Marcus then puts the cucumbers in a mason jar and covers with the pickling liquid and the jar lid. I just stick them in a bowl. Refrigerate for at least 3 hours before serving. The pickled cucumbers will keep in the fridge for at least 2 weeks. Cook the potatoes in salted water until tender, about 20 minutes. In another pan, cook the carrots and apples in salted water until tender, about 15 minutes. Heat the olive oil in a medium skillet over medium high heat and add the onion, garlic, shallots, vinegar and honey. Reduce the heat to medium low and cook, stirring often, until the onion and shallots are tender, about 10 minutes. 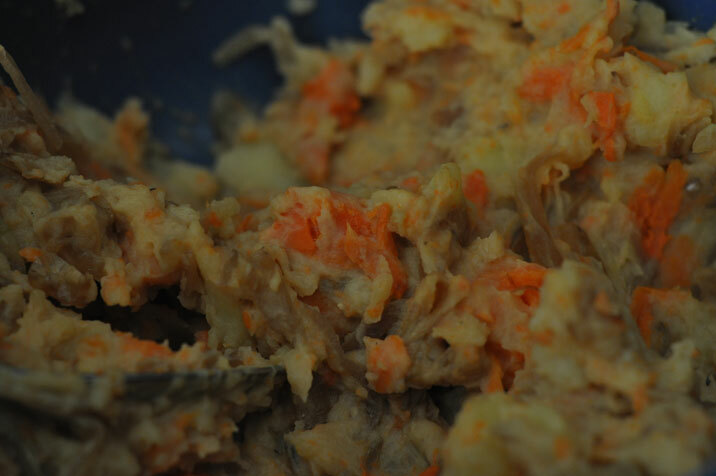 Drain the potatoes, carrots and apples and return them to one of the cooking pots. Mash coarsely with a fork or potato masher. Stir in the buttermilk, horseradish, and onion mixture. Season with salt and pepper to taste.